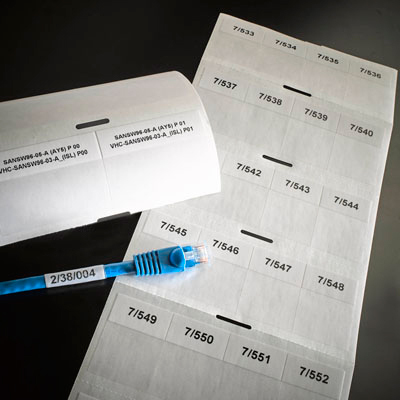 To complement our engraved labels, we also provide very high quality, printed wrap-around cable labels. Our labels are thermally printed onto vinyl, which has two benefits; thermal printing is very durable and vinyl has no “memory” so once it is wrapped around a cable it will not try to un-wrap itself. We take the hassle out of the job by printing them for you. If you have any technical questions please get in touch, we will be more than happy to advise. 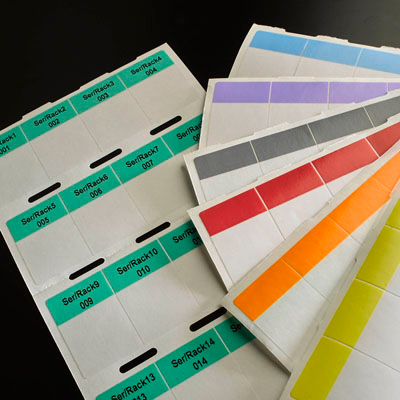 Simply call or email us your number sequence (start and end is sufficient if sequential) and we will supply the printed wrap around labels in an easy to use strip format. Labels are sold in sets of 4, meaning minimum waste. Your number sequence is printed onto the coloured surface at the top of the label. The rest of the label is made from a clear, adhesive vinyl which wraps around the cable to self-laminate and protect the printed surface. Water resistant, heat resistant and excellent adhesion. We have a range of sizes to suit your cable width. Please see our chart below for size, colour and price details. Please don’t hesitate to get in touch. Thomson Cooper Ltd, trading as Ask Engraving. All rights reserved.